April 05, 2019, 9:45 a.m.
Our latest polling shows a single point lead for the Conservatives. On the face of it, that’s exactly the same position as we found ourselves in on December 17 when we ran our last poll of 2018. But the crucial change over the last several months is that both main political parties now have a combined share of 63%, compared to the 80% share they enjoyed in December. Support is falling away – but at the same rate. The key to the changes in voting intention over the past few months has been the extent to which the main two parties have retained their 2017 voters. In December both parties retained two thirds of their voters from the last election. A gap widened through January and February, with the Conservatives static but Labour’s retention dropping to just over 60% in January, and then a little over 50% in February. 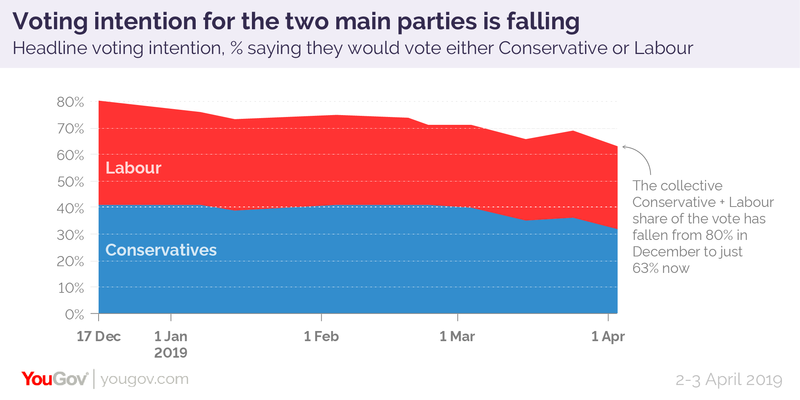 This meant the Tories took a lead in our voting intention polls over the period, peaking at an 11 point lead on 23rd February. In this specific poll, the Conservatives were retaining 67% of their 2017 voters, whereas Labour were just retaining 51% of theirs. 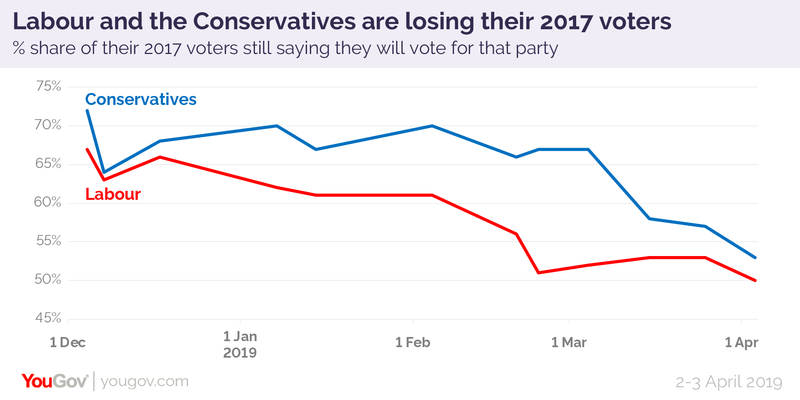 But in March, while Labour’s retention remained about the same, the Conservatives lost a portion of their 2017 voters. In our latest poll just 53% of them said they’d vote the same way in our latest poll (compared to 50% amongst Labour voters). You only have to look at the party leaders to glean some reason why the voters are moving away from the two main parties. In our standard question asking who would make the best Prime Minister, fewer than half of respondents are even willing to choose between the two: 29% say Theresa May, 20% Jeremy Corbyn, but 51% either say not sure or refuse to answer. Firstly there are lots of voters who are switching directly to other parties. In our latest poll, 18% of those who voted Conservative in 2017 say they’d vote for a different party if there was a general election tomorrow, 22% of 2017 Labour voters say the same. Very few voters are moving to Labour from Conservative and vice versa. The movement is towards other smaller parties namely the Lib Dems or Greens for 2017 Labour voters, and UKIP and the Brexit Party for 2017 Conservative voters. Another place voters can move is to “don’t know”. At the start of December, the number of 2017 Conservative voters saying they were unsure who they’d vote for if there was an imminent election was 15%, for labour it was 16%. Now, those numbers have risen to 20% and 21% respectively. What would be the result of a general election? Outside of a general election campaign, when party politics isn’t on most peoples’ radar, it’s not unusual to see voters moving between parties. With Brexit dominating the news agenda we’ve seen sharp, short-lived moves to and from the major parties in direct response to events in Parliament. For example, in our voting intention polling immediately after last year’s Chequers summit, where the Prime Minister softened her Brexit position, many leave voters left the Conservatives, meaning they fell behind in the polls. However by the end of August this trend had reversed and the party retook a consistent lead. Immediately prior to the 2017 election being called, 24% of 2015 Labour voters were saying they didn’t know who they’d vote for in a new election, with only 48% saying they’d stick with Labour. Fast forward to a week before the actual election and that “don’t know” figure reduced to 13%, with 72% of 2015 Labour voters saying they planned to stick with their party. And yet, we still have two very unpopular parties, with two very unpopular leaders. And as an added difficulty, if there is to be a general election in the near future then it’s difficult to see anything but Brexit dominating the campaign. 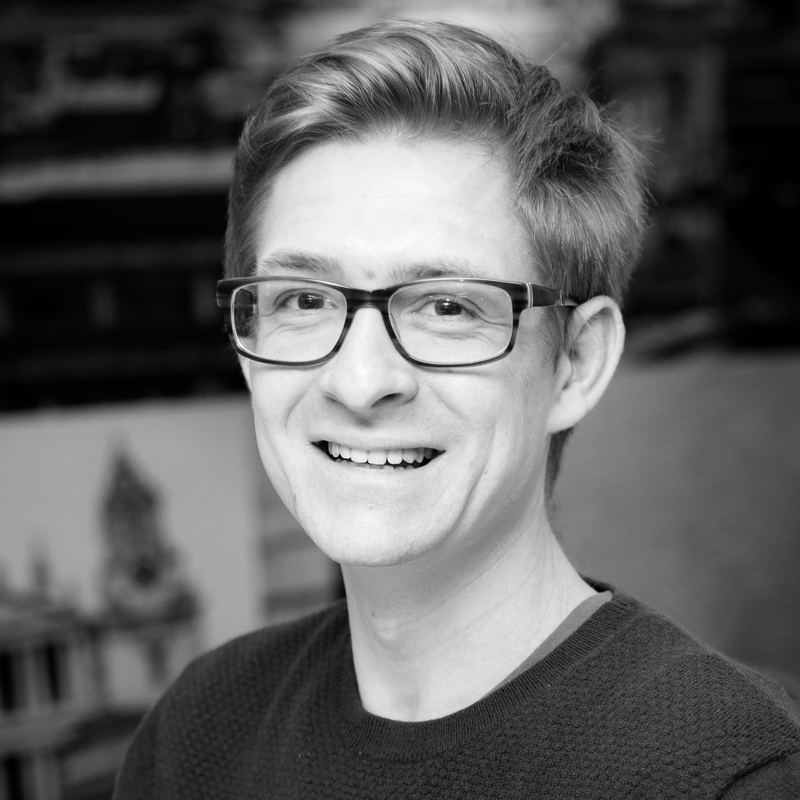 The public think both Labour and the Conservatives have an unclear approach to Brexit and with the emergence of new parties such as Change UK and the Brexit Party, running on very clear mandates concerning the EU. Meaning we will face an election where the two main parties will need to fight off competition from a number of quarters, not just from each other.